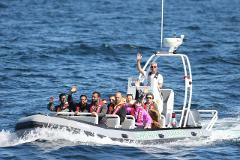 Our 28 ft Zodiac Vessel "Tourmaster" accommodates 12 passengers. Senior age is 65+, Student is 19+ with Student ID, Child age is 3-18, Under 3 years old not permitted. Our 19 ft Zodiac Vessel "North Star" accommodates 7 passengers. Senior age is 65+, Student is 19+ with Student ID, Child age is 3-18, Under 3 years old not permitted.